Staffa Tours operate four purpose build vessels each meeting the highest design and safety specs. All our vessels are purpose built for marine tourism and have plentiful indoor and outdoor space to ensure our passengers comfort whilst getting the best views possible. MV Ossian of Staffa was built and launched in 1993. It was designed and built to the highest design and safety specifications on the Isle of Wight by FBM Workboats Ltd, boatbuilders to the RNLI. MV Ullin of Staffa was specially built for us in 2000 by New Century Marine at Arrochar on Loch Long, Argyll. 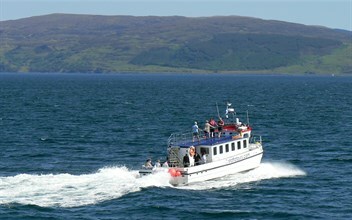 New for 2012, the MV Islander (pictured right) operates mainly from Tobermory. was purpose built for us and launched in July 2011. It has been exclusively designed with comfort, speed and safety in mind offering the quickest and the most stable way to take in the wonders of the west coast. The vessel has ample room with seating indoors for up to fifty passengers as well as additional exterior seating at the stern, standing at the bow and a 360° upper deck viewing area to ensure the Islander offers the best possible viewing platform. See more photos of all out boats over in the gallery. All our vessels are purpose built for marine tourism and have lots of indoor and outdoor space to ensure our passengers comfort whilst getting the best views possible. All boats meet the strict standards of the Maritime and Coastguard Agency.